Service Rank and Number / Rheng gwasanaeth a rhif: Signal Boy J/41665. Military Cemetery/Memorial / Fynwent milwrol: Plymouth Naval Memorial, Devon. Ref No Grave or Memorial / Rhif cyfeirnod bedd: Panel 13. Country of Cemetery or Memorial / Gwlad y fynwent neu gofeb: England, United Kingdom. Killed in action during the Battle of Jutland, aged 16 years. Peter James Thomas was born in Rhyl, Flintshire on 24 November 1899 and Baptised on 11 February 1900. His parents were Richard Henry Thomas, born 1872 in Rhyl, Flintshire, who was employed as a Coach smith ( a maker and mender of horse drawn carriages) and Violet Thomas (nee Dowle) who was born in Monmouthshire in 1879. Peter had two sisters – Violet Anne Thomas, born 1904 and Gladys May Thomas, who was born in 1910. He was educated at Christ Church School, Ernest Street, Rhyl, Flintshire and Clwyd Street School, Rhyl. The 1911 Census shows that the family at that time were living at 3 Windsor Street, Rhyl, Flintshire. During June 1915, at the age of 15, Peter enlisted as a Second Class Boy in the Royal Navy and joined the training ship HMS Powerful, followed by further training on HMS Ganges where he became a Signal Boy. (His duties involved communicating between ships by means of hand held flags). His Navy Records describe him as 5′ tall, brown hair, grey eyes, fresh complexion, chest measurement 30.5 inches. His occupation prior to enlistment was given as Boy Scout. He was medically examined and passed fit for military service. Signal Boy Peter James Thomas. Signal Boy Peter James Thomas aged 16 was the youngest serviceman from Flintshire to be killed in action during the First World War. 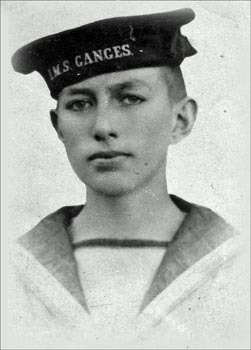 In December 1915 he joined the Battle Cruiser HMS Invincible as a Signal Boy and was killed in action aged 16 years during what was described as the greatest naval battle of the First World War, The Battle of Jutland. 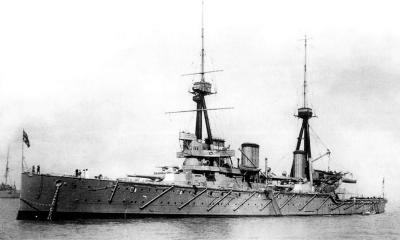 HMS Invincible was sunk at 6.32 pm on Wednesday 31 May 1916 by the German Battle Cruisers SMS Derfflinger and SMS Konig who both fired salvo after salvo into Invincible causing her to break in two, when the stem and stern rose apart high out of the waters. 1,026 Officers and Crew were killed, leaving only 6 survivors who were picked up by HMS Badger. Peter James Thomas is also remembered on a Remembrance Plaque at The Royal Alexandra Hospital, Rhyl, Flintshire and on The North Wales Heroes Memorial Arch, Deiniol Road, Bangor, North Wales.